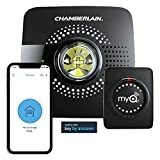 The first-generation Chamberlain MyQ Smart Garage Door Opener was an awesome $100 device that let you control your garage door from any smartphone or tablet. Now there’s a second-generation Chamberlain MyQ Smart Garage Door Opener available though, and it’s better in literally every way. It’s more reliable and has better Wi-Fi so that you never have to worry about a failed command. Best of all, it’s somehow even less expensive than the original model at just $79.99!